THE ELLEN DEGENERES SHOW has been on summer break and I am going through withdrawal. I like dancing along with Ellen in the morning, and her show is always a good way to start the day. And now it seems that we’re getting an extra dose of Ellen…on TBS. 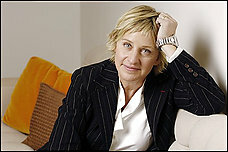 Emmy-winning talk show host and comedian Ellen DeGeneres is bringing her winning personality to TBS this November, when she presents ELLEN’S REALLY BIG SHOW, according to an announcement made today by Michael Wright, senior vice president in charge of the Content Creation Group for TBS, TNT and TCM. The two-hour variety special will feature performances by top talents from the worlds of comedy and music. It will be shot at HBO and AEG Live’s The Comedy Festival (TCF) at Caesars Palace in Las Vegas, for which TBS serves as title sponsor. It will then premiere on TBS Sunday, Nov. 18. The way I see it…the more Ellen the better, so I’ll be watching. I laughed out loud at Ellen’s TBS/coffee comment. Wow, she’s a busy lady. First the Oscar’s and now this. Go Ellen! We love ya. the footwurk kingz is gonna rock ellens really big show!!!!!!! missed the show, will it be repeated, I hope?? My husband and i were quite ecstatic that Chris could complete his homework by way of the concepts he gained when utilizing the website. It truly is now and once again perplexing to just discover yourself handing out thoughts other folks might have been trying to sell. We genuinely realize we have got the internet site owner to be grateful to because of that. The main explanations youâ€™ve made, the effortless website menu, the friendships you may support to instill – itâ€™s most exceptional, and itâ€™s really facilitating our son in addition to the family do think this subject is amusing, and that is unbelievably important. Many thanks for all of the pieces!